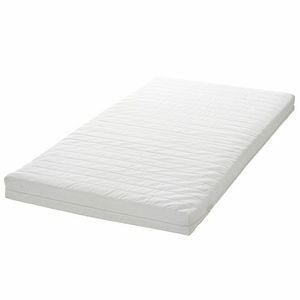 The crib mattresses could create a gap between the mattress and crib ends larger than allowed by federal regulations, posing an entrapment hazard to infants. The firm has received two reports of infants becoming entrapped between the mattress and an end of the crib. The children were removed from the gap without injury. This recall involves more than 300,000 IKEA VYSSA and SULTAN style crib mattresses. The following model names are included: SULTAN BLUNDA, SULTAN DROMMA, SULTAN SNARKA, SULTAN SUSSA, VYSSA VACKERT, VYSSA VINKA, VYSSA SPELEVINK, VYSSA SLOA and VYSSA SLUMMER. The involved mattresses were manufactured on May 4, 2014 or earlier. A gap between the mattress and crib ends larger than two finger width is an indication of the defective mattress. IKEA stores nationwide and online at ikea-usa.com from October 2000 to May 2014 for between $20 and $100. Consumers should immediately stop using a recalled mattress and inspect it by making sure there is no gap larger than the width of two fingers between the ends of the crib and the mattress. If any gap is larger, customers should immediately stop using the recalled mattresses and return it to any IKEA store for an exchange or a full refund. Customers can also contact IKEA at (888) 966-4532. IKEA toll-free at (888) 966-4532 anytime or online at www.ikea-usa.com and click on Product Recall near the bottom of the page for more information.